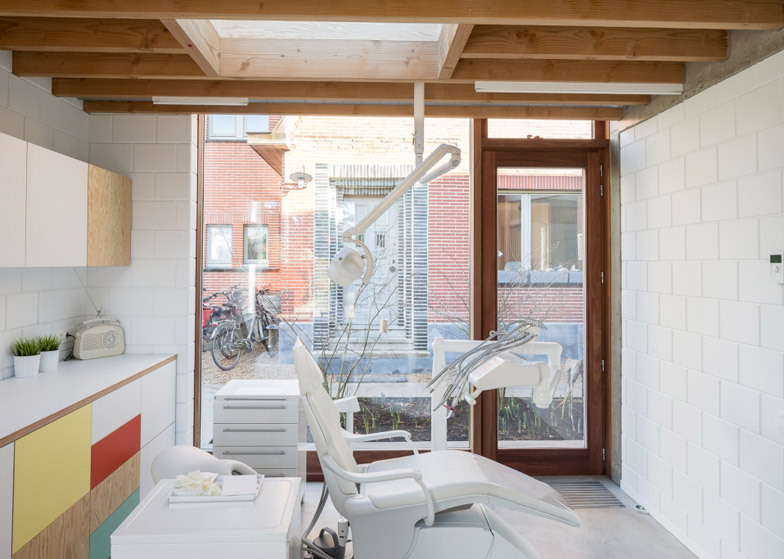 Declerck-Daels Architecten used different varieties of timber and "frivolous" colours for this surgery in Bruges, in an attempt to make going to the dentist more bearable (+ slideshow). 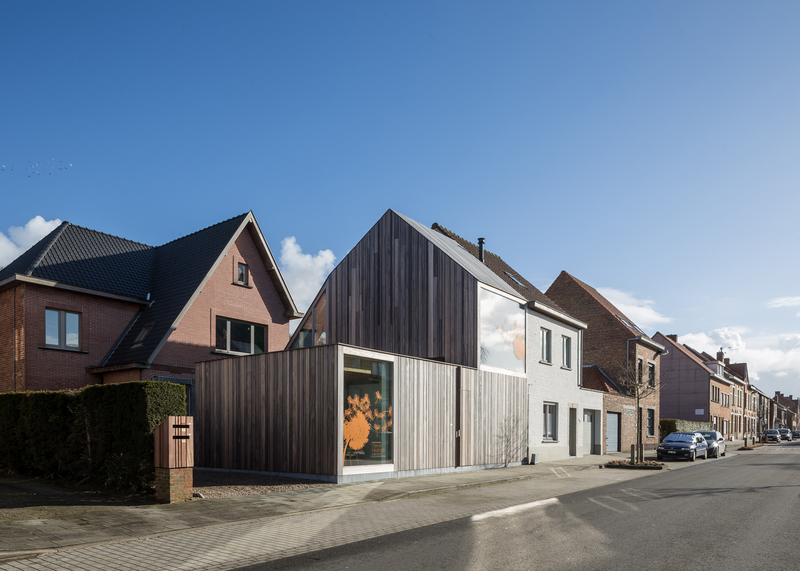 The Belgian studio named the project 50 Shades of Wood after the variety of tones found in the building's silvery timber cladding, as well as its brightly coloured wooden interiors. 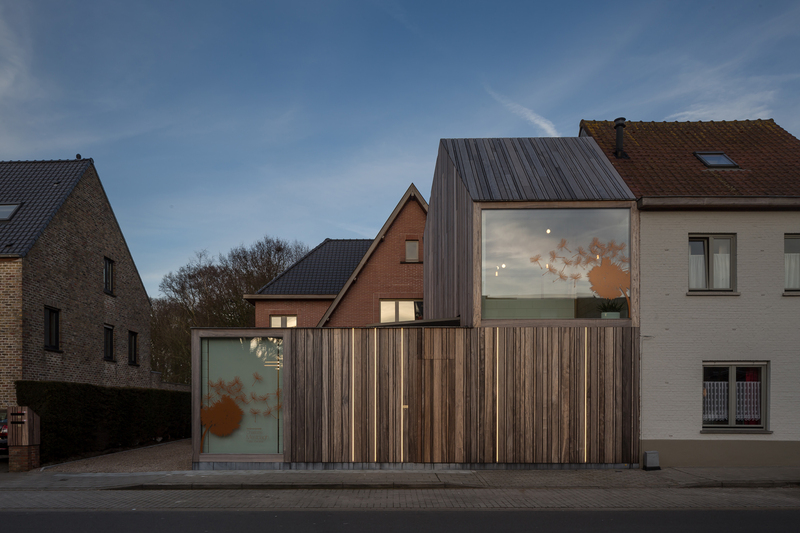 The surgery sits in front of a red brick house on a residential street in Bruges and its silhouette is a mirror image of its neighbour. The pitched-roof volume that forms the upper portion of the building continues the line of the terrace, while a lower rectilinear volume acts as a plinth. Its height is designed so as not to block views from the windows of the residence behind. Glazed sections of the facade are decorated with vibrant orange graphics of dandelions. The large windows provide glimpses of the dentist's painted wooden interior from the street. "To expose the structure and the honest materials a lot of attention was paid to the numerous details, counting on the craftmanship of all the builders," said the architects. "All materials play a key role." "Wood is a warm, soft and tactile element, and is found in all shades: wooden beams, cladding, windows, stairs, ceiling and fixed furniture," they added. 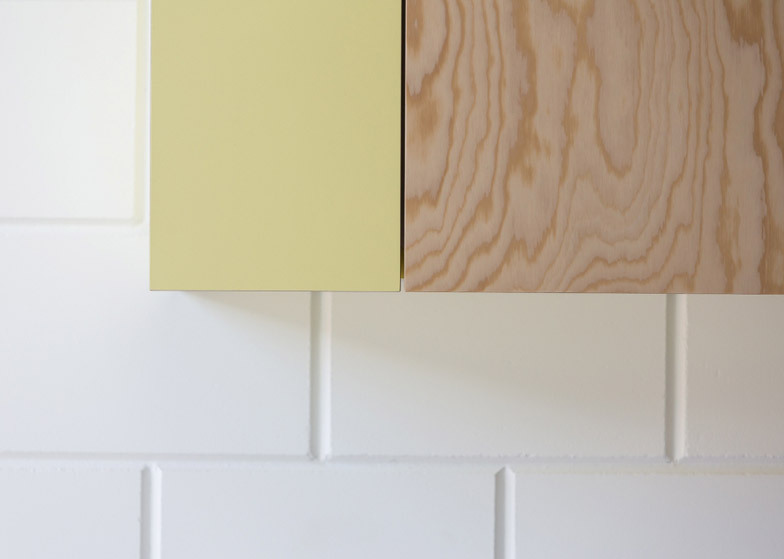 "It is combined with exposed concrete, calcium silicate units and frivolous colours. There's nothing to hide." 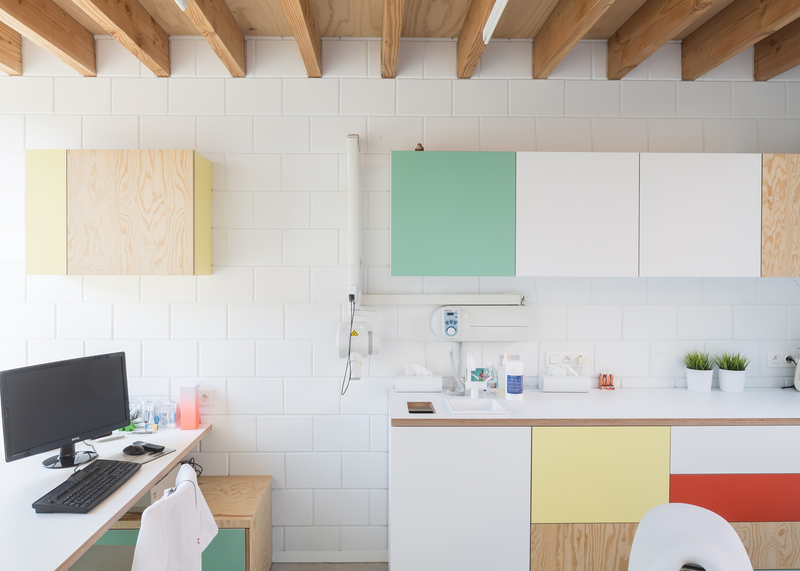 Blocks of bold paintwork and upholstery break up the surgery's exposed timber cabinetry, raw concrete floors and beams, tiled walls and sterile white equipment. A skylight and glazed gable situated by the examination area are intended to distract patients during their appointments. The glazed gable points towards a small garden patio, which is tucked behind the lower section of the building to hide it from the street. "The project is the result of a strong symbiosis between architecture, interior design, structural engineering, technical engineering, landscaping and decoration – padded out with playful accents," said the architects. "It is gracious, warm and welcoming. It's an original and perhaps funny approach to a dental practice." "There's an abundance of light and patients are distracted by the clouds seen through the skylights above the dental chairs," they added. Photography is by Thomas Debruyne.